So stand up, get up, back up. Ever notice how much digital stuff you accumulate? Notice how you have copies of copies floating around in different directories, on different machines? How much of it is important? I’m not going to preach about backups… we all know what we need to do. I can honestly say that I do it, and it has been a part of my life for many years. It saved me about two years ago when my laptop got stolen. Simply bought a replacement a I was fully operational within hours. It is just like insurance. You hate paying the price, but when the promise is made good, you feel it has all been worthwhile. What would you do if you lost a movie? These days most people would kiss their DVD goodbye and use the misfortune to upgrade to a Blue-ray version. What if you lost an entire digital library? Maybe a little hard to imagine just yet, after all, how many people have digital movie libraries on their home network? But what if the same thing applied to all of those great digital photos? Your MP3 library? Is this why I’ve started to see SANs and Mirror drives starting to become a consumer category? Not too many at your local big box electronics store just yet, but certainly a whole range on-line for the serious hobbyist consumer. I have seen my children lose files. 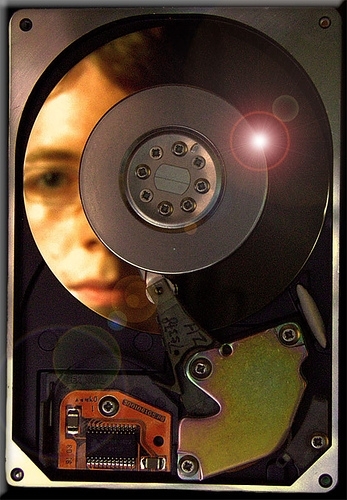 Having grown up with computers, they accept it as a normal thing and source another copy from the web immediately – even though they can get the backup quite easily. So it leads me to a conclusion that the consumer of tomorrow is more likely to see the ‘cloud in the web’ as their information/data/content repository and not really be bothered with a SAN in the basement. I, on the other hand, will continue to indulge myself and keep a copy… just in case. to find out why we’re lost. and you want to run from here. Are we finally getting traction? I used to make a great distinction between IPTV and “over the top” video. I still do. I also maintained that as the quality of the online video experience improved, we’d see a blurring between the two approaches, and that would be the tipping point for a mainstream acceptance of video over IP delivery. That day is finally at hand. Recently MRG published a report finding that global IPTV subscribers would grow from 27.7M in 2009 to 81.0M in 2013 with an associated 32% CAGR. A bit down from their previous CAGR of about 50%. I guess the global financial meltdown had to have some effect. Ponder this… There are many markets that are considering (or already employing) hybrid STB technologies to receive linear feeds via satellite and interactive via broadband. These approaches also contribute to the overall numbers published by MRG. In the US, Sezmi is a good example of this type of delivery. As broadband penetration increases, then it makes sense that IPTV or video over IP will also increase correspondingly. Yes, I think not only is it time to abandon those BNC connectors for IP and make the move to digital, but there is mounting evidence to suggest that broadcasting (via RF, Cable and Satellite) as we know it, may be simply become alternative IP delivery streams. Perhaps broadcast engineers now have a reason to learn some IT after all – or perhaps just retire, and warm by the glow of their valvyon* memories. Tell me is isn’t so… I’m listening. *A contrived word to eulogize the halcyon days of valves. Every once in a while I have to check myself to ensure that I am getting things right about IPTV. There is soooo much confusion in the marketplace from a variety of sources, some accidental, some intentional, some is generational and some is borne out of a lack of understanding. What is IPTV? Easy, video (TV) over IP! This is where, for the moment, I part company. By the above definition, the service provided by AT&T’s U-Verse product is exactly the same as that provided by YouTube or Hulu. Somehow that just doesn’t seem quite right. Obviously not alone with this definition, ‘the industry’ coined a new term of “Over the Top”. This is video that is delivered over any generic IP connection, be it ADSL, Cable Modem, 3G, WiFi, WiMAX or other. Therefore it would seem that a major differentiator is quality (and price!). “Over the top” cannot yet match that quality of experience. Partly because of the encoding techniques and partly because of the buffering/partial downloads required to smooth out the non-deterministic nature of the delivery mechanism, in this case the internet. Add to this complexity the user interface issues, and the ease of getting Web video into the lounge room, and… well you get the picture (or not – pun intended). In order to overcome this mess, many new services are focused on VOD in order to define a niche by competing directly against DVDs and suchlike. They enable you to download content to a box (even your PC), and you play it locally – you pay for the bandwidth/storage tradeoff with time. But the value proposition is that time investment is still less than running to your local ‘Video Store’. This brings up another point. Is video the same as TV? Likely in the future it will be. But today, TV is a streamed, real-time medium that brings appointment shows to facilitate a collective experience. As we increasingly personalize our content consumption real-time will become an increasingly moot point – except perhaps for competitive events like elections, sports and for time specific events like live concerts and news. It will be ‘my time’ TV (TM). So IPTV is not just TV over IP. It is a managed service, that ensures comparable (or in many cases superior) quality TV experiences to that of the current home RF delivery mechanisms of Antenna, Cable and Satellite. But this is just the first step. With a common IT network infrastructure, your STB is now capable of allowing you to self-provision many more applications and services – just think of an applications store for the lounge room TV experience. Can I do that on any other IP infrastructure? Yes, its called the web. And maybe that’s where the confusion lies, that fact that it can be done, rather than being done well. But we all have come to expect that even this will change. So in the future IPTV will be video (TV) over IP, but just not today. where does cable go from here? I want to look inside your head, yes I do. Is it just about big pipes? Here is an infrastructure that is largely heterogeneous and leverages legacy technologies that are so interconnected and tangled, that developing new applications and having them deployed costs a lot of time and money and support. Cable will be ‘out-apped’, out-serviced, out-priced, out-maneuvered and very quickly out-dated. What cable does well is manage video content better than the IPTV providers. Nonetheless, it is going to take a very brave cable operator to take plant and equipment and re-invest heavily to move to IPTV. Right now it doesn’t make economic sense. But they’d better be planning for it… change is inevitable. Ask the free to air broadcasters about cable and satellite. Ask the print media about the web, ask the record manufacturers about CDs, and then about MP3. I could go on… Now, that doesn’t mean cable will go away, it just means that there will not be as much money flowing through that business as once was. A bit of good news… Many IPTV providers looked to their cable brethren for talent hire and have found themselves saddled with bad cable practices on their shiny new platform. A temporary setback I’m sure. IPTV is inevitable. Technically it makes sense, economically it also starting to make sense. As the media utility becomes the norm, the appliances will just plug in… and they’ll plug in via IP. Already the networks are eagerly HULUing an over the top IPTV play. Oh, and did I mention that the consumer is quite likely using cable bandwidth to enjoy that experience! Capping that IP bandwidth (both economically and technically) is only a temporary tactic at delaying the inevitable. Focus on your expertise – managing a video network, leveraging content and those big fat connections. Get with the program and forget about QAM and those stream filtering, RF tuning STBs. Move to IP and save yourselves. The Telcos are coming. They have deeper pockets, a green field infrastructure, an ability to roll out services faster than lightening, and an eagerness to learn about video – just as aggressively as cable demonstrated its eagerness to learn about VOIP. Another year and another NAB. Although I typically post on a Thursday, I was dragging by the end of the show. Getting home late after such a draining exercise was a great reason to postpone any writing effort. Attendance was down. No surprise. But the interesting side-effect of this was that the quality of the meetings I had, on average was far better, with more engaged people. There were fewer tire kickers. Time was important. Most NABs, people are late for meetings, if they show up at all. This year, for some reason, I cannot think of one scheduled meeting that was late or cancelled. 3D is here. Seems as though most other stuff was about speeds and feeds, or derivatives of existing products and processes. However, there was a real lot of innovation happening in the 3D world, focused on production, presentation technologies and general focus on getting this technology to the consumer. It’s just around the corner folks. Business Models. Sun held our Media Advisory Board and the topic was on advanced advertising. I was amazed at the level of interest, the degree to which some organizations are investing and building their business models around it, and most importantly, the lack of common language as to what it all means. Even our friends in the advertising world are not in agreement. Sun also conducted a test of a pilot Video As a Service for IPTV delivery. The economy. Every year at NAB there is a job board, but this year, it was busier than ever. Looking forward to seeing you all next year.